"I know my God saved the day and I know his word never fails and I know my God made a way for me..It's gonna be alright...Salvation is here." Those words are words to a praise song that I have sung hundreds of times...but they truly stuck out this morning. To see children from all over the world, from true hopelessness, singing about the joy and Salvation that only the Lord can give was simply convicting. How often do we claim, "It's not gonna' be alright." or "God, your way is not working out," and here they are...singing truths to us! World Help is an organization similar to Compassion International. They take children in impoverished situations, overcrowded homes, or orphaned children and obtain sponsors for them. Through sponsorship, they are able to have schooling, clean clothing, and the opportunity to learn about Jesus. Each year, this organization brings 10-20 children to the US for 10 months to tour as Children of the World children's choir. 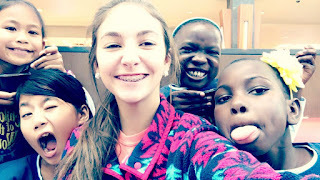 They do this in order to raise money for their organization so that more children can be sponsored, but also to give these children an opportunity to see the US and see the opportunities that could be available if only they break the cycle of poverty and lack of education. Calvary was privileged to host the Children of the World choir this weekend. 10-20 sponsored children who are chosen based on grades, poise, and an application process are on the tour each year. This year, there are 13 children touring--8 girls and 5 boys. While it may seem odd that these children are taken from their 3rd World homes for a year and paraded around the US, the more I think about it, the more I think...it is a win-win. It brings the mission field to those in the US who may never be willing or able to leave the country. It brings awareness of crises occurring all over our world. We are often so first-world blind that we forget about the rest of the world! Additionally, it opens up the eyes of the children to what opportunities are out there (outside of their little communities). Each of the girls who stayed with me wanted to be teachers, nurses, and singing teachers for children in their community..."so they could grow up and not be so very poor". What an encouragement it is to see children desiring to "be the change" in their area. How many American children have that same desire? Moose and I got to host four precious girls at our home. Two of them stayed in our guest room and two in Eva Kate's room. I joked that we are teaching her about missions and how to share at a young age, but it is my prayer that we continue to take opportunities to share what God has blessed us with and Eva Kate grows up with the mindset that it is just what you do! Piling up in mommy and daddy's room for two nights so that sweet girls from Nepal, Uganda, and Honduras could have a comfy place to sleep while they are in the US to tell others about Jesus should be the norm! Giving up our comforts to love on others and share God's grace should be an everyday thing for us. I pray that as Eva Kate grows up, we never use the excuse that it is too difficult or uncomfortable. The children arrived on Friday afternoon and did a sound check at the church. Then, the host families picked them up. That evening, Morgan came over and we just hung out. The girls showed us their braiding techniques and played with EK. We ate beef stew for supper (they were fans of the broth!) and roasted marshmallows on an inside fire. We finished the evening with some cartoons and showers for all. On Saturday morning, we met up with the other groups and headed to downtown Greenville to the Children's museum. The children sometimes get to do fun things in the cities they visit, sometimes play at the host family's home, sometimes have organized events...it just depends on the group they are with. The past few groups had been in smaller towns, so the kids spent a lot of time riding bikes and playing games. We decided to take them to the Children's Museum for a little change. No...seriously...it was a lot of fun. One little girl who stayed with us, A, said "it was no fun at all." Her sarcastic and funny personality was Mackenzie's favorite! The girls loved that Auntie Mack and Auntie Mo came along to the museum and they had lots of big friends to play with. Eva Kate even enjoyed some of the events at the museum! After the museum, we went to the mall for Chick-fil-A. My former boss, Keith, was another one of the host homes, so we hit up his Chick-fil-A for lots of yummy food! Of course, we had to spend some time using the snapchat filters! After the mall, we were ready for a relaxing afternoon! Moose's sister Angela and her daughter Camdyn, as well as Chelsea and Livi, came over for the afternoon to hang out and visit. We had a full house and spent some time watching cartoons, playing Spoons, playing Trouble, and playing Uno! Girls after my own heart--game lovers!!! That evening, we had a children's event at the church. The Children of the World joined with Calvary's Kidz and had a blast jumping on bounce houses, playing games, and eating pizza! Sunday morning was the actual concert. I have it recorded on my Facebook Live if you would like to see a sampling. It was amazing! The dancing, drumming, and of course, singing was incredible...but more incredible to me was the message. These children reminded me that hope does not come from stuff..or from comfort..or even from family! Hope comes from God and God alone. How quickly we forget that every good and perfect gift is from above.......and that we can be blessed with God's love and His favor even when it appears that we are "not doing well". What a sweet reminder for us all! These kiddos were so good with her! "Uncle Keith", "Auntie Pam", "Uncle Moose", "Auntie Megan" and our girls! Whether you choose to sponsor a child from World Hope, send donations to Compassion International, go on International missions trips, host missionaries from foreign countries, support missions financially, or simply pray......you ought to choose something! God calls us to serve in our Jerusalem (home), Judea (our own state), Samaria (our country), and even to the ends of the world (that one is obvious, right?). What are you doing to make a difference and further the gospel right now? My heart is for the young adult in these areas. So often we focus on the children that when they "age out" of programs, they are forgotten. My prayer is that I can make a difference in these young women's lives in the Dominican Republic. What is your heart? How can you serve? How can you help show that salvation and rescuing from the Lord is truly here. God makes a way for His own...and oftentimes it is through the work of others. What can you do?